In the first half, Inter’s pressing and the key role of Matías Vecino allowed Inter to hinder Milan’s buildup and create many good chances. In the second half, Gattuso switched Milan to a more aggressive 4-4-2 setup and a more crossing-heavy strategy. What ensued was a high-tempo and intense game, which Inter ran away with. With the signings of striker Krzysztof Piątek and midfielder Lucas Paquetá, AC Milan is now finally a team that can string together some wins in a row. Thanks to Paquetá, Milan’s midfield play is more dynamic than before and better equipped when pressed. Thanks to Piątek, Milan can generate shots in the box despite their attack struggling to disorder defenses enough to generate spaces in the box. Before this Derby della Madonnina, they had not lost a league game in 2019, collecting six wins and two draws. Despite the great results, tactical issues are far from over for manager Gennaro Gattuso. Milan are one of the strongest defensive units in the league (third lowest expected goals conceded), but even with the reinforcements, their attack is still somewhat rigid and predictable. Against Internazionale, Gattuso and Milan lined up with their usual 4-3-3 lineup. Goalkeeper Gianluigi Donnarumma was defended by a back four of Davide Calabria, Matteo Musacchio, Alessandro Romagnoli and Ricardo Rodríguez. Defensive midfielder Tiemoué Bakayoko was accompanied by Franck Kessié and Lucas Paquetá. The forward line featured a trio of Suso, Hakan Çalhanoğlu and Krzysztof Piątek. Before this derby, things were not going well for crosstown rivals Internazionale. 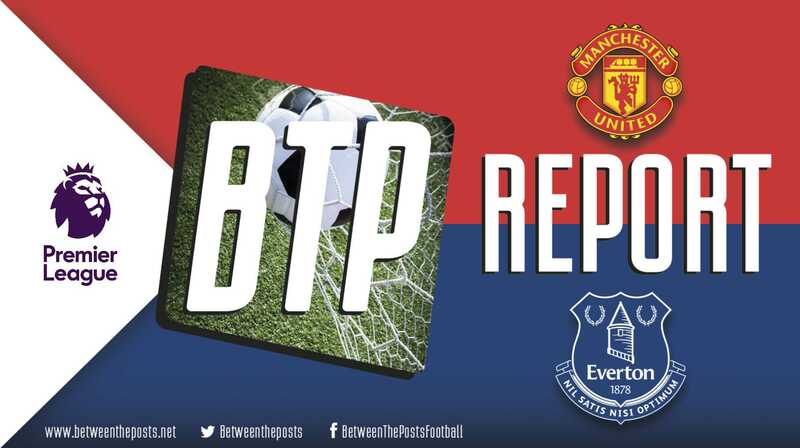 Their 2019 league form has been troubling, with three wins, two draws, and three losses, despite playing against mostly lower and mid-table opponents. These negative results led to AC Milan overtaking them in the league table and endangering their much-wanted Champions League position. Despite the best efforts of an increasingly influential Brozović, Inter experience difficulties in building up good attacks through the center lanes. Thus, Inter’s primary chance creation mechanism is crossing into the box, which is rather inefficient. This strategy has become even less effective in the absence of star striker Mauro Icardi. Against their archrivals, Inter lined up with a slight adjustment in their usual 4-2-3-1 shape. The goal of Samir Handanović was defended by Kwadwo Asamoah, Milan Škriniar, Stefan de Vrij, and Danilo D’Ambrosio. Midfield featured a trio of Marcelo Brozović, Roberto Gagliardini and Matías Vecino, who had been given more freedom than usual to go forward. In the forward line, striker Lautaro Martínez was flanked by wingers Matteo Politano and Ivan Perisić. With Radja Nainggolan injured, Spalletti decided to assign his role to Vecino, another box-to-box midfielder. Vecino played a very aggressive midfield role, playing in front of the Gagliardini – Brozović double pivot, 4-2-3-1 is one of the most frequently occurring formations in football. The two most defensive midfielders are called a ‘double pivot’. almost acting as a second striker beside Martínez. Inter’s 4-2-3-1 shape in possession against Milan’s 4-5-1 low block. Notice the advanced position of Bakayoko. Vecino was the key to Inter’s offensive superiority during the first half of the game, as he moved undetected behind Milan’s Bakayoko. Bakayoko has been a key player for Milan’s midfield this season, combining physicality, work rate and the ability to dribble and carry the ball past opponents. However, fielding Bakayoko as a lone holding midfielder comes with a key defensive defect: he often fails to recognize when to chase his rival and when to stay back and defend a space. This is particularly problematic in the kinds of low defensive blocks A defensive block is the compact group of defenders that defends a particular zone, either their own half in a medium defensive block, or the zone around their own box in a deep defensive block. that Gattuso’s Milan make use of. Against Inter, Bakayoko kept rushing forward to attack or press a rival, leaving space behind his back, territory Vecino constantly attacked. This allowed Vecino to slip undetected into Milan’s box and get into good goal goal-scoring positions. The results of Vecino’s movements were devastating. During the first half, he was able to shoot four (!) times from inside Milan’s box. One of those shots was Inter’s first goal of the night, in the second minute. 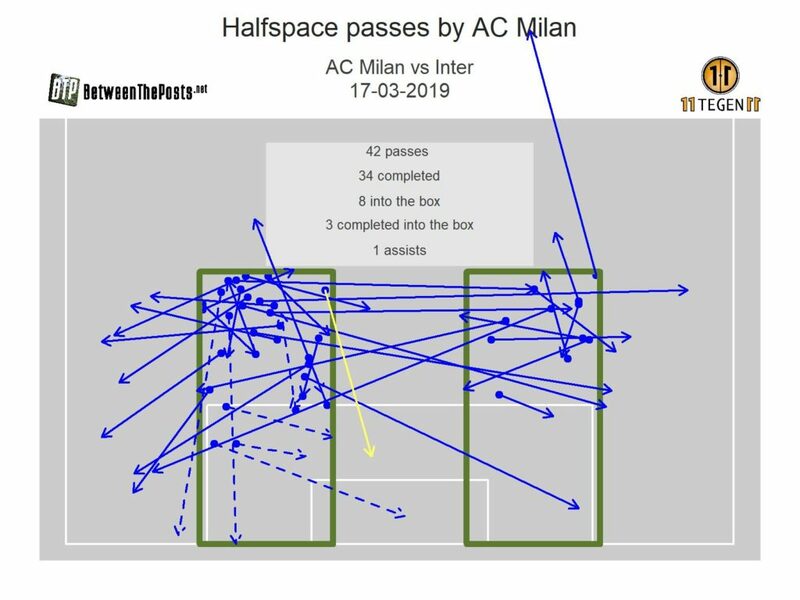 On the other hand, Milan were often not able to create chances from inside the box, as they were disconnected by Inter’s pressing scheme. 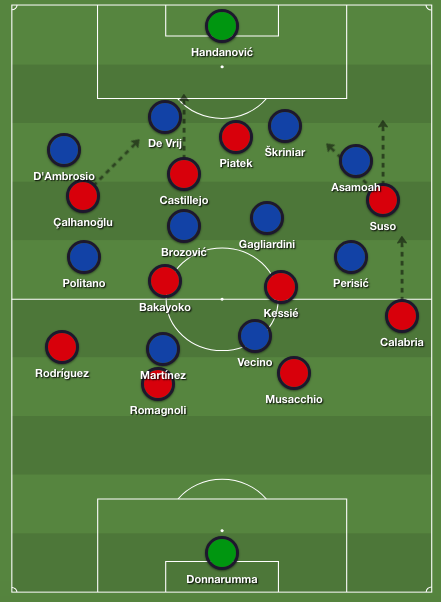 The Inter press was not particularly aggressive, with Milan defenders Romagnoli and Musacchio being given enough time and space to play out from the back. However, Inter became aggressive once the ball got to Milan’s midfielders. The main objective of Inter’s press was to prevent the opposing midfielders from turning, facing the goal and connecting with their forwards. Inter mostly succeeded in this task, which is why Milan struggled significantly with their midfield progression. Wingers Suso and Çalhanoğlu often had to drop deeper to support their midfielders, but that meant they were too far away from the final third to create chances or move into Inter’s box to shoot. There is nothing worse in football then seeing creative players drop back ten to fifteen yards deeper because they are simply not getting enough on-ball action. It was even made worse by the conservative positioning of Milan’s fullbacks, who rarely ran forward enough to support the wingers. After a dire first half, in which Milan shot only five times, Gattuso understood his team needed changes and he was not shy about making them. He surprisingly subbed out his most creative midfielder in Paquetá for Samu Castillejo and moved the team to a 4-4-2 scheme. 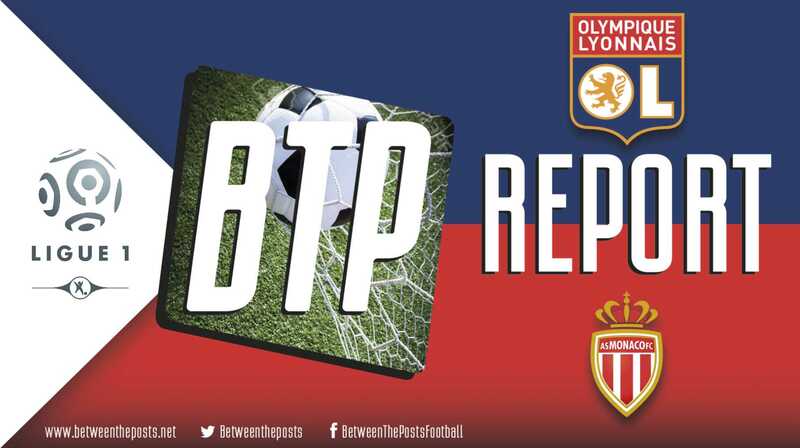 Bakayoko and Kessié formed a double pivot, Suso and Çalhanoğlu played on the wings, and Castillejo and Piątek formed the forward duo. In this formation, there was more protection in the middle of the pitch, as both Bakayoko and Kessié could pay attention to Vecino’s and track his runs when necessary runs. Furthermore, Milan tried to be more offensive and press a bit more aggressively, sending fullbacks forward more often. Milan’s 4-4-2 shape in possession against Inter’s 4-4-2 low block. Milan had far more possession in the second half (63% overall), but their 4-4-2 shape made them more dependent on mostly fruitless wing play. This was reflected strongly in Milan’s chance creation, which relied more heavily on crosses to create shots. Right back Calabria and right winger Suso produced thirteen crosses throughout the second half, for example. In the 51th minute, Inter scored their second goal, a fantastic short corner kick routine that was finished by De Vrij. After this, Gattuso decided to double down on this strategy. He subbed Ricardo Rodríguez for striker Patrick Cutrone, and made the faster Castillejo move to the left winger position in the 4-4-2 formation, giving Milan more speed and dribbling on the wings and more presence in the box with Cutrone. Despite Milan’s newfound dominance, results in the second half would not get much better than in the first. 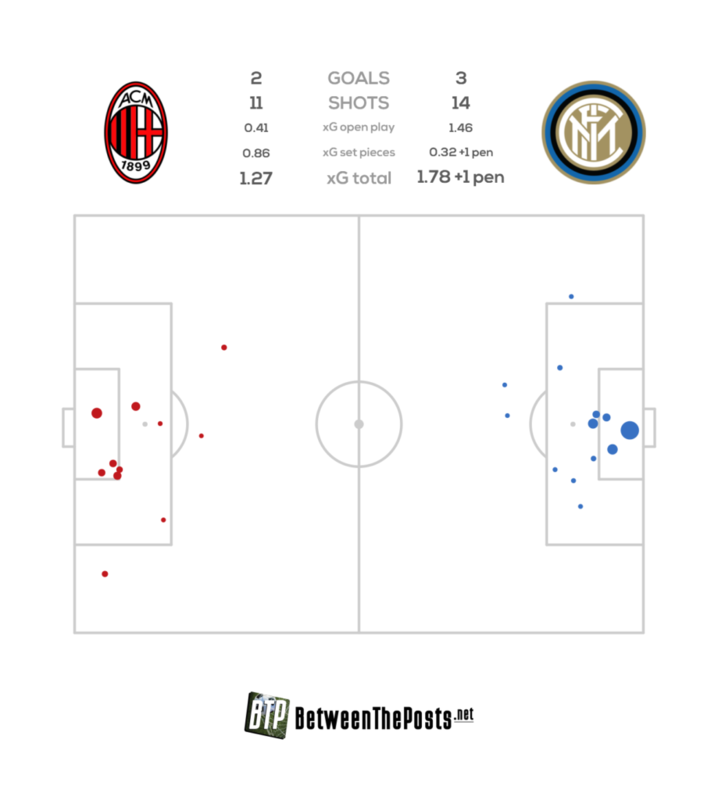 Milan controlled possession and bombarded Inter’s box with crosses, but they generated only two shots from open play. Ultimately, their goals, just like Inter’s, came from set pieces. A Çalhanoğlu free kick was perfectly headed by Bakayoko in the 57th minute. Castillejo made a foul in the box that led to a penalty kick in the 67th minute, the spot kick being converted by Lautaro Martínez. 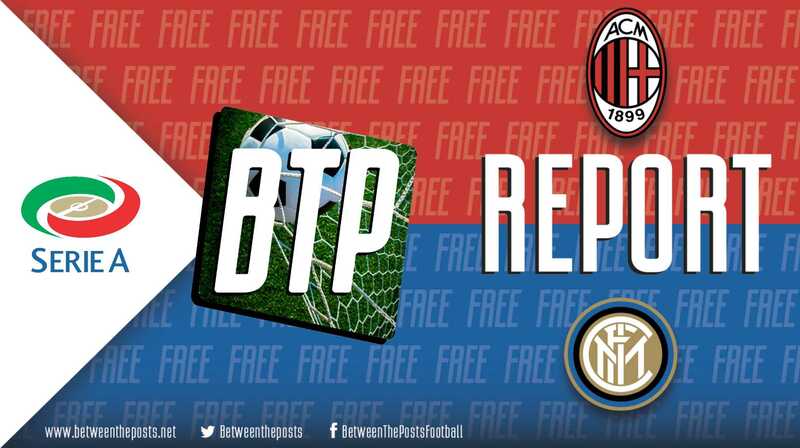 After going up by two again, Inter fully conceded the initiative to Milan after that third goal. They stopped pressing altogether and opted to defend in a deep block in their own half of the pitch. After Musacchio scored after a short corner in the 71st minute, the fourth set piece goal of the game, Inter’s defense managed to clear most threats away from their box, led by a fantastic Milan Škriniar (six clearances during the second half). Inter’s more passive behavior was understandable, but perhaps they conceded too much initiative to their rivals. The 73rd minute substitution of Brozović (Inter’s best progressive passer) for Borja Valero did not help, either. In the last final minutes of play, Inter’s defense ultimately needed some last-ditch heroics to prevent Milan from drawing the game, as shown by the spectacular injury-time block from D’Ambrosio in the 95th minute. It was hectic, it was chaotic and it was scrappy, but in the end, Inter got the three points. AC Milan created more than half of their expected goals from set pieces. Despite their recent great results, this game reminds us that Milan are still very much an imperfect team. Even with Paquetá, Milan still depends too much on their wingers (Çalhanoğlu and Suso) for chance creation and midfield progression, and their midfield is still susceptible to being pressed. Besides, Milan often loads the opponent’s box with relatively few players and can struggle to generate shots. However, even within the limitations of his squad and tactical conservatism, Gattuso has shown several times this season that he is willing to make significant tactical changes to turn around the course of games. His switch to a 4-4-2 formation and a more aggressive behavior in the second half is yet another example of his good in-game management. This victory comes at the best possible time for Inter, who were desperate for a win like this to break out of their bad streak. Their attacking system is still predictable and dependent on crosses, but their pressing game is still a great tool to hinder opponents and create better chances. Meanwhile, Vecino showed that in the absence of Nainggolan, he can be a great box-to-box alternative for pressing tasks and attacking the opponent’s box. Besides, Inter are still a very reliable defensive unit who know how to “suffer” and defend their box when they are not able to dominate an opponent. It is clear that Inter still have a lot of fight in them and will try to hold on to their Champions League spot with everything they have.